Estate agency, as we’ve known it, is changing. Pre-internet, our job was to provide information; post-internet, it our job is to explain it. Every vendor and purchaser, landlord and tenant, not only has all the information they think they need, right there at a click of their mouse, but they also have something we don’t: the time (and arguably, the inclination) to spend hours sifting, sorting and disseminating this huge amount of data. Where then, does that leave us? What’s the point of an estate agent? But what about those clients who don’t need that extra reassurance of using a high street agent? Those digital- and social-savvy folk who can take their own photos and upload them, who can write a decent description, who understand how to present their property for viewings, and who are actually pretty good at conducting those viewings? What do they need from an agent? In a word, ‘portals’. That’s all. And if all our savvy sellers need from their agent is access to the portals, then they don’t need you. They need an online agent. No justification from you about all the ways you earn your 1.5% fee will persuade them that you will do a better job than an online agent, because in most cases, you won’t. They simply don’t need that level of service. Imagine you’re going on holiday, taking an early morning flight, and you decide to book an airport hotel for you and your family, for the night before. You weigh up the options available, which range from a Premier Inn at £80 for a family room, to £200 for the Hilton. How would the Hilton justify their price? They may tell you that the room is a superior one, with a whirlpool bath, fully-stocked mini-bar and 30% more floor space than the Premier Inn. They will doubtless wax lyrical about the superior bedding, the special toiletries and the high-speed internet. But all you want is a bed for the night for you and your family, close to the airport. Which hotel are you going to choose? None of us wants to pay for extra services we don’t need. Of course, if both hotel rooms were the same price, then of course we’d choose the Hilton. But they aren’t. And that’s deliberate. You see, Hilton don’t want Premier Inn customers, any more than you want online sellers, because they share something in common: they don’t value the extra level of service. You want clients who appreciate the service you give, and who understand the value of it. Clients who are prepared to pay for that quality of service, because they need it, and want it. Those sellers who don’t want those services, and frankly, don’t need them, are not your clients. They are the clients of the online agents. They are attracted by the simplicity of the offering, the lower fees, and the fact that they are much more in control of their own marketing, and ultimately, their sale. I know, because I am one of those sellers. The last three houses I have sold, I have used an online agent. Because, let’s face it, I was doing all the work. I staged the house professionally, and photographed it myself, wrote all the copy, had a twelve-page brochure designed, researched and identified the optimum asking price, then found and trained a local viewing rep to do all my viewings. In all three cases, the house sold in the first month of marketing, for just below the asking price. The online agent fees I paid were simply for portal access. I’ve mentioned two different kinds of clients here – those who need the extra services from you and who are willing to pay your fee for access to those services, and those clients who want to do it all themselves, and who will do a good job. The former is your client, the latter is not. 1. Decides to sell his property; invites three agents out. 2. Doesn’t like any of the valuations, feels they are too low. 3. Thinks agency fees are extortionate. 4. Watches Sarah Beeny and thinks he can do it himself. 5. Books an online agent and markets his property at 20% more than the highest valuation, with rubbish photographs. 7. After a few months, drops price to 10% more than the highest agent valuation. 8. One viewing, poor feedback, no offer. 9. Drops again to highest valuation received, but the property has now been on the market for 6 months, and has become stale. 10. Goes back to most optimistic agent, tries to haggle fee. 11. Drops price again, blames agent for lack of interest, eventually accepts very low offer and tells everyone it was the agent’s fault. Recognise him? He is actually your biggest problem. The rest of the sellers have already picked a side – online or high street – and are happy with their decision. It’s the fence-sitters; the penny-pinchers; the ones who think they know it all: they are your worse clients. They won’t see the value in your service, but need it anyway, so any negotiation with them, either on fee or valuation, will be difficult and non-productive. They are most likely to be unrealistic on asking price, and least likely to be willing to negotiate even a good offer. They will take up your time, your energy, and your good humour, and neither of you will feel you’ve got a good deal. You’re looking for win-wins: an agreement where both parties feel they have got a good deal, and where the respect and need is mutual, and equal. In other words, where they value you just as much as you value them. Forget the savvy sellers; they are not your clients. The good news is that you may never get across their doorsteps anyway. They know what they want, and they are happy to do it on their own. Try to spot those tricky clients: those who want a high street service for an online fee. Give them a wide berth. Quote your fee with pride and confidence, and do not drop it. Focus your time, energy and marketing on attracting your true clients: those who recognise the value of your service, and who are prepared to pay for it. Those clients who respect your experience, advice and expertise, and who appreciate that they need you to help them to reach their goals. These are your true clients. You don’t need as many of them, (check out my post The Pumpkin Plan) and they will be easy to deal with, pleasant during negotiations, and profitable when the sale goes through. The health of your business relies on your ability to spot the type of client standing in front of you. Figure that out, and react accordingly, and you will see a big difference in the wellbeing of your team, the saleability of the properties you take on, and ultimately, your bottom line. 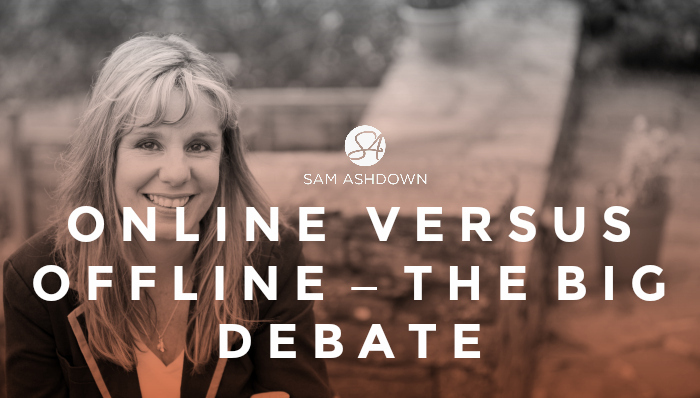 If you’d like to have a chat about this, drop me a line at sam@samashdown.co.uk– I’d love to hear from you. What to do next:Sign up to my Supertips – 1000s of agents already have! Speak to Sam: If you’d like to have a chat about how you can do it differently, drop me a line at sam@home-truths.co.uk- I’d love to hear from you. Previous post Your Rightmove profile – are you wasting it? Very timely Sam. I had one if these today. I am going to unpack my service and see if he bites. If not I will let him get on with it himself and watch what happens. Great Article Sam and very helpful not just for estate agents but also potential vendors to help them realise what’s what. please learn go back to the nursery ………..
What an ill-considered and conceited reply from the rather aptly named “brainless blog”, undoubtedly an online agent or their voicebox…..
Great article, I agree completely that the fence-sitters are a nightmare. I recently used an online estate agent to sell my house and, while I found it was easier to monitor and proceed with sales etc, it didn’t provide the same level of service as a bricks and mortar estate agent would have done. Both have their plus points and I think it’s important to recognise that! I am about to launch an online estate agent for the residents of Kent. This is a well balanced article which really beings out the benefits to the customer of both business models. Having different methods of bringing property sales to the market can only be a good thing.